Barry, Cisco, Caitlin, and Julian travel to Gorilla City on Earth-2 in order to rescue Harry from Gorilla Grodd. Meanwhile, Wally and Jesse try to determine their relationship status. Gorilla City was awesome. The architecture, the gorillas, the world--everything looked great and reminded me of Planet of the Apes and King Kong in the best possible way. The special effects in this episode were amazing, which helped bring the gorillas and Earth-2 to life. Grodd and Solovar were terrifying, especially when they used Harry and Cisco to talk. And I thought highly intelligent gorillas were creepy. Highly intelligent and telepathic ones are worse. This episode brought Jesse and Harry back, even if it was in a small way. I've missed them. The best moment was between HR and Harry, which was hilarious and perfect. And Jesse and Wally finally, finally got together. Though, I guess we'll have to see if that will last when they tell Harry. Of course, the precious cinnamon roll was the best in this episode. Not only did he dress as Indiana Jones for most of the episode, but he went to Earth-2 in order to protect Caitlin and make sure she knows who she is--not Killer Frost, but a good person. And then the end! At the end they go have dinner together. I can't deal with these two! Please, my shipper's heart won't take it if this ends badly. The showdown between Barry and Solovar was freaking epic. All the special effects were cool. Solovar looked amazing. The arena looked amazing. And Cisco and Julian coaching Barry through the fight was great. Plus, Barry using a "Reverse-Flash" move was perfect. Basically, this entire episode was worth it just for that fight. This episode, however, was a bit predictable. I knew that Harry's kidnapping was a trap. I knew that Grodd was using Barry to get rid of Solovar so he could become the new gorilla leader. And I knew that Grodd was planning to invade Earth-1, using Barry or Cisco or whoever to do it. If I can figure that out, why can't these geniuses figure it out? This episode was also easy. Too easy. Barry defeated Solovar with little effort. Yeah, he got knocked down a couple times, but then one quick "Reverse-Flash" swipe through his chest defeated a giant, intelligent gorilla. Come on! Also, tricking Gorilla Grodd--who, may I remind you, is also a highly intelligent gorilla--was too easy. How did they do that without Caitlin turning Killer Frost? Because she didn't kill him? 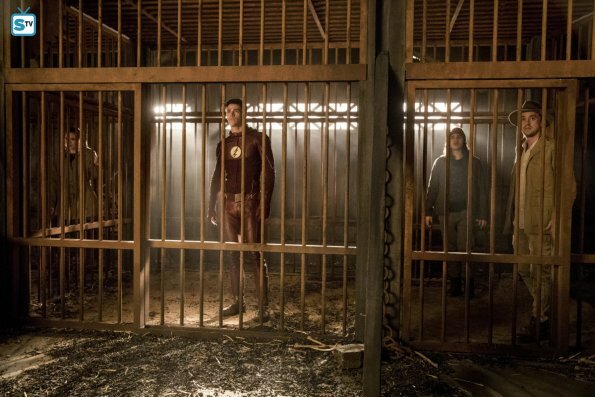 Why did Grodd bother dragging Barry out of the cage if he was dead? Why not just leave him there? It didn't make a whole lot of sense, and it was just an "easy" way for the writers to get Team Flash out of Earth-2 without too many consequences. While I'm stoked that Wally and Jesse are finally together (or something), it was kind of annoying that the only reason Jesse was acting weird is because she missed Wally and wasn't sure what their relationship status was. I was hoping there was something deeper there--like she was no longer a speedster or she was having trouble being heroic on Earth-2. But no? Just romance. Uh, okay then. Why was death the only way to stop Grodd? Why did someone have to die? Yeah, sure, they couldn't use their powers. But... ??? They're Team Flash, they can come up with something better than, "Let's sacrifice Cisco in order to stop Grodd to save Iris." No. Let's not sacrifice Cisco to save Iris. That doesn't make sense. Also, if they killed Cisco, how would the rest of them ever get out of Gorilla City/Earth-2? Um, your logic isn't logical! Most of this episode was fantastic. I loved the trip to Earth-2, the return of Gorilla Grodd, and Julian's protectiveness over Caitlin. While some things were predictable or came across as illogical or easy, the episode as a whole was exciting, and I'm looking forward to part two of the Grodd story arc. What did you think of "Attack on Gorilla City"?